Born and raised in Burlington, Brock explored his creative side throughout the GTA and Manhattan, NY. During his 14 year career he has trained with L’Oreal, Aveda, and Schwarzkopf and fell in love with the science behind colour. He also worked at Clarins Paris and has over 10 years experience as a freelance artist specializing in bridal makeup. He was recently certified with Temptu airbrushing makeup in New York. Always one to continue learning, his love for high-end looks and clean lines brought him to the Fashion Institute of Technology in Manhattan, where he studied menswear design. Brock conveys his passion for design in not only his own fashion and technique for hair, but also in the interior design of his exclusive boutique salon. 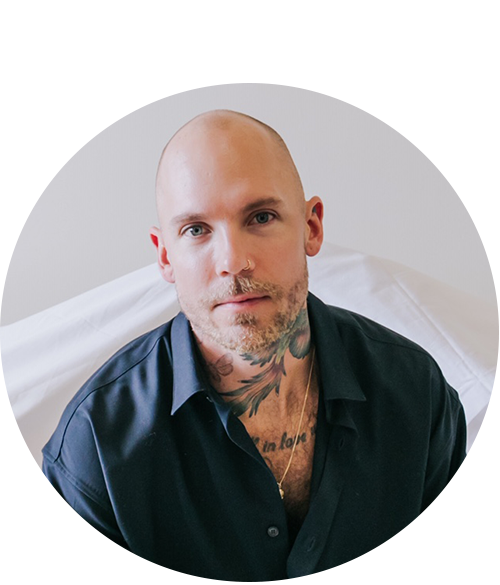 Brock prides himself on giving one-on-one attention to his clients and ensuring they have the look of creative hair, yet easy to manage and maintain until their next appointment. Born in Northwestern Ontario, Sarah moved to St. Catharines to study health sciences at Brock University. After a conversation with her Aunt, a Hair Stylist, Sarah realized she wanted help people in a different way, help their inner beauty and confidence shine on the outside. She has trained with Aveda and Vidal Sassoon and joined the Aveda Education Team. Sarah has been a member of the Storm Hair Group for over 10 years and was thrilled to have the opportunity to style hair for the 2015 Canadian Juno awards. Sarah is excited to bring her extensive experience of formal styling and extensions to the clients of Studio B.
Taylor’s always had a passion for hair from the time she was a little girl. Not knowing the talent that was right in front of her, she attended post secondary education in Kingston Ontario for veterinary technology. Soon realizing that she wasn’t at her full potential she then switched into hairstyling. Working at a salon in Kingston for a few years Taylor decided to move home to Burlington. Taylor specializes in blondes and balayage where she recently took a guy tang balayage class in Chicago. Having Worked with Wella, Redken, pravana and Schwarzkopf Taylor loves preforming any colour service that is right for you! As head of salon security Miles greets each client as they arrive for their appointments. He came to Studio B shortly after it’s opening in 2013 and can frequently be found napping on his favourite throw blanket. In his spare time he freelances as a pet therapy dog and fashion model. Miles loves treats but is allergic to liver. Ready to meet our stylists?